» Know Thyself: Why Are Billy Crystal and Josh Gad Starring in ‘The Comedians,’ an Adaptation of an Obscure Swedish Meta-Sitcom? Larry Charles — Seinfeld writer, Curb Your Enthusiasm director, Sacha Baron Cohen collaborator, and walking comedy fable — calls from Marrakech on Easter Sunday to discuss a new TV project called The Comedians. The show, which premieres today on FX, follows the lives of two comedians, one older and one younger, played by Billy Crystal and Josh Gad, as they struggle to put together a television show for FX starring Billy Crystal and Josh Gad. “Are you just traveling?” I ask Charles of Marrakech, which I’ve heard is the kind of heated, labyrinthine city whose streets fold in on themselves, sort of like a Larry Charles plot. “I wouldn’t just come here to travel,” he says, but takes another half-hour or so to finish his answer. Despite being a show in which Billy Crystal and Josh Gad play themselves, The Comedians is based on a Swedish format — that’s the word the television people use — called Ulveson & Herngren, which aired about 10 years ago on the country’s national public broadcaster, SVT. “Amazingly enough, the Swedes have comedy shows,” Charles says.1 This is about all I know about Ulveson & Herngren, other than that Charles describes it as “an extremely dark show in which two comedians who play themselves are forced to do a TV show together,” and that if you translate its Swedish-language Wikipedia page, there does seem to be a subplot about alcoholism. Twenty-five years ago, the idea — of a show about a show in which performers play themselves — might’ve sounded radical; now it verges on routine.3 Charles, of course, is partially responsible for this, but he also sees himself as part of a much broader continuum. “When I was a kid, we had shows like The Jack Benny Program, Burns and Allen, The Joey Bishop Show — shows where the comedians played themselves, where they’d turn to the camera and address the audience,” he says, then widens the circle to include directors like Jacques Tati and Luis Buñuel, who treated reality like a plate of hors d’oeuvres, grazing when they felt like it and letting it pass when they didn’t. Put another way, the narratives aren’t new; what’s new is how we talk about them. Charles attributes this, above all, to cultural amnesia. “My daughter’s 28 — she knows about this stuff because of me,” he says. “But if you ask most people of a certain age who Jack Benny was, they have no idea.” Age and how it leaves you behind, incidentally, isn’t just a theme of The Comedians, but of the story behind it: It’s easy to imagine someone as conventionally showbiz as Billy Crystal seeing Louie or Seinfeld’s Comedians in Cars Getting Coffee and sensing tectonics at work. 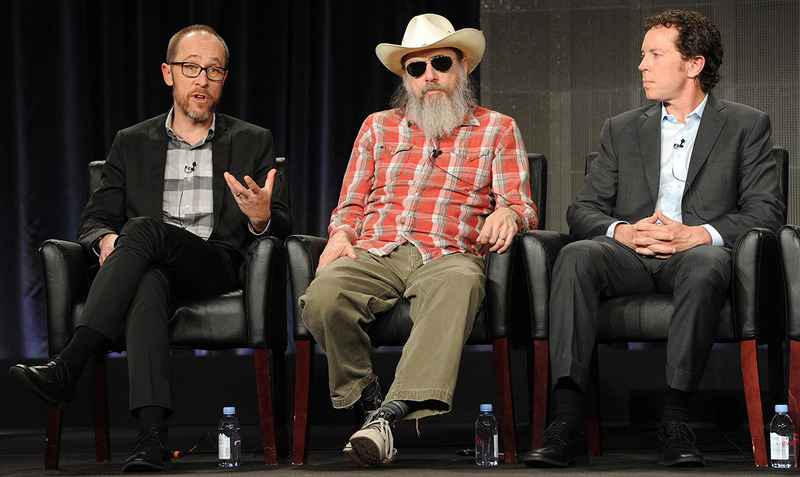 FRANK MICELOTTA/FXBen Wexler, Larry Charles, and executive producer Matt Nix. We come back to economics, or go further into it. “Curb and Seinfeld were very cheap to produce,” says Charles. The Comedians cost a little more, he says, but not much. I tell him a story I heard somewhere about a Louie episode in which a helicopter arrives without warning and leaves without explanation, just to blow the budget they had left over. He likes that: It offers an arbitrary response to an arbitrary situation. Like how The Comedians is a show about two American comedians playing themselves but is based on a show from Sweden. As for the pitch, which I’m curious about given that The Comedians is in part about a show’s slippery relationship with its network, Grad says Crystal seemed excited about it, the network was attracted to the ideas, and, elementally, “It was really funny.” We talk about development for a few minutes. Grad is genial and open. Then, in a moment of the snake approaching its own tail, he mentions that Grantland has savaged the show, but seems to have taken it on the chin.4 He confesses that he wishes he had a cooler story for me about the show’s genesis, but the gist is that everyone at the network was excited by the idea and thought it would work. Then he pauses and says that sometimes when the critics are in town, Crystal and Gad will be answering panel questions and pause to whisper to each other about whether this is an episode of the show or something else. Crystal made a similar joke on a recent press tour, adding something about bad weather and alcoholism. The two met in the early 1980s on a Saturday Night Live–style project called Fridays, which, incidentally, is where Charles also met Michael Richards and Larry David. “Separation of church and state,” he says of our conversation.